68 days. It seems like a good amount of time, but with each day passing faster than the last, Badwater approaches. 68 days to get ready, to train, to iron out all the logistics.....68 days. We (myself and the crew) will learn our fate as far as starting time goes this Friday. It certainly will not be the 10:00 AM Third Wave which comprises all of the elite runners. There are plenty of views on which starting wave is the most ideal (6:00 AM, 8:00 AM or 10:00 AM). Some favor the 10:00 AM wave on the grounds that it minimizes the total amount of sun exposure during the first day. Others might hope for the 6:00 AM start and a chance to begin at cooler temperatures. Personally, I'm just happy to have the opportunity to be in Death Valley in July (uh, did I just say that ? ), and will take whatever start time I get. Preparing for Badwater is a multifaceted project. There is a tremendous amount of non-training organization and preparation that is required to compete in this event. One of the most important facets is the assembling of a crew. It is imperative to put together a group that can act as a cohesive unit. I have often heard that when it comes to Badwater, "the crew makes the runner", and that without a crew there really is no runner (true, the race requires that each racer be accompanied by a support crew comprised of at least one four-wheeled motor vehicle and two crew members at all times). While crewing for Jacki Florine at last year's event, I was able to see just how important the crew can be. 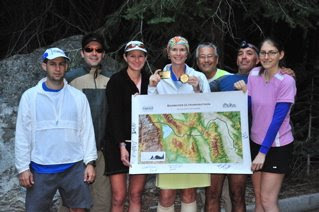 Although Jacki assembled a team of "rookies" (myself, Meredith, Eddie, Mike, Paul and Peggy - pictured with Jacki above) with no prior Badwater experience, it was the group's ability to work together and address issues on the fly that helped make Jacki's Badwater experience a memorable one. Jacki's crew had a great sense of humor, interjecting a bit of comedy at times into otherwise stressful conditions and situations. The crew needs to be organized, constantly monitoring the status of the runner and supplies. The crew also needs to understand that they too need to be prepared for the conditions associated with Badwater - they must eat, drink, replenish electrolytes....do everything necessary to keep themselves physically able to make the crossing. So, when putting together my crew, I tried to assemble a group that would bring, among other things, personality, experience in ultra running, and the knowledge of what it takes to run long distances, and I believe that we have a great group. The crew consists of Wayne Bates, Jeff Tropple, Brian Krogmann, Jennifer Vogel and Lane Vogel (pictured at left after finishing the Umstead 100 Mile Endurance Run in April). This group provides the perfect mix of experience and knowledge, as well as some top-level ultra runners. Brian placed 3rd overall at Javelina Jundred 100 in 2008 (18:25;35). Jen and Lane are experienced triathletes, and have completed several ultras, marathons and Ironman triathlons. Jen is running the Keys 100 in two weeks and is expected to place in the top 3 (if not win it all). There will be more to follow on the crew as we get closer to Badwater. Aside from getting physically prepared to run 135 miles in temperatures that reach into the 120s, there is a need to get mentally prepared. I have quickly learned that talking to other runners who have competed at Badwater is a key component to mental preparedness. For starters, I am coached by Lisa Smith-Batchen, a 9 time Badwater finisher (including 2 first place finishes in 1997 and 1998 - pictured at left in last year's event). Defending women's champion and friend Jamie Donaldson has been unbelievably willing to provide great advice and support. I have traded e-mails with Jonathan Gunderson (a 3-time Badwater finisher), spoken several times with good friend and Badwater finisher Tom Triumph, and last week I had the pleasure of talking to Coach Scott Weber for nearly 2 hours about his Badwater experiences. Coach Weber is a 12 time finisher of the Badwater Ultramarathon, and has also 5 solo crossings to his credit (including 12 Mt. Whitney summits). It was amazing that Coach Weber gave up some of his personal time and provide me with invaluable tips and thoughts on how to prepare for and survive Badwater. Talking to other runners about their own personal experiences at Badwater is mentally soothing and turning the "how am I going to run in this heat" thinking into "ok, this is exactly what I need to do to survive the heat". Logistics are also a big factor in getting prepared to run at Badwater. There are hotels to reserve in multiple locations, vehicles to rent, crew coordination issues to deal with, and, of course, a crap-load of supplies to amass. Training. Ah, yes, there is actual physical training. So far things are going well. Last Sunday I paced my good friend Kristen at the New Jersey Marathon. It was a great opportunity to get in some quality road miles. Kristen ran a perfect first half, but the weather (cold and rainy) and some physical issues made for a tough second half. We would finish in a respectable 4:29:53. In two weeks I am heading to the Keys 100 where I will crew and pace Lisa and Sister Mary Beth Lloyd as Sister Mary Beth, dressed in her requisite nun’s habit and a pair of running shoes, runs from Key Largo to Key West in search of her first 100-mile finish. This will be a great opportunity to get in a good amount of road miles in hot weather. After a quick switch back to trails for the Pineland Farms 50 Mile Trail Challenge on May 24, the opportunity to get in some additional long road miles could come on May 30/31 from joining Ira Zaroff on part of his annual 120 mile run along the south shore of Long Island to Woodmere to raise funds and awareness for Friends of Karen, a nonprofit group that helps children and their families cope with devastating and life threatening illnesses. My cross-training sessions (stationary bike and Stairmaster) now involve dressing in layers. This morning, for example, I put in 30 minutes on the Stairmaster wearing sweats, and followed that up with a power-walking session on the treadmill (30 minutes at inclines 8-10). More on training and preparations to come.....heck, we've got 68 days left of posts to play with. Man, I can't imagine all the planning that must go into preparing for Badwater! Good luck as you continue to dedicate yourself to it. Sometimes I forget just how much is involved in just getting to the starting line at Badwater. Good luck with it all. It sounds like you have a great crew and great advice for the race. Going to one hell of an adventure Tony !!! Time to get Lean and mean baby!!! Dude, craziness! I am soooo stoked for you! What an exciting time! I cannot wait to hear how all of this goes! So cool! It's good that you've crewed prior to running it because you have that perspective. You'll have humidity to help you acclimate in NJ. Here, we have to suit up and run in the desert. I'm excited for you too. Dude, instense stuff... Enjoying following your journey. OMG I can't wait to hear more.